James Martin just cooked a fillet steak on a program I'm watching and he said the resting time should be approximately 50% of the cooking time. He was in France and though he didn't mention it I'd say he cooked it medium-rare. ...so they DO describe medium rare as a point, then. Literally, "to the point" ... beyond which it has been cooked too far. Your link actually says "A steak in France cooked “ à point,” will be rare-to-medium-rare, with the accent on the rare"
Which is exactly what I was explaining, n'est-ce pas? I would add that in France you often don't get asked at all how you would like a steak - it comes a point by default. A request for "tres bien cuit" could precipitate disbelief or laughter (or both) of course. Which I find to be too over cooked for my liking. Which is entirely your prerogative, for which I do not criticise you at all. By-the-bye, the French spelling, in my experience, for the chunk of meat is usually "un steack"
I agree with the quality of the Aldi brands, and the marmalade of course. In my opinion... well my wife's really, the fresh fruit and veg can be their let down. They do not have a sell by date or best before date, but have some various code numbers, but I think Aldi staff are not good at rotating stock, maybe they don't understand the codes either. Rotten oranges, three days after purchase is a classic example. We now don't bother with their fruit and veg anymore, problem solved. We have 6 Aldi stores within a 6 mile radius, but only one Lidl. Your link actually says "A steak in France cooked à point, will be rare-to-medium-rare, with the accent on the rare"
Mais oui, I was simply pointing out the actual meaning of à point to those who might not know. Medium rare - not to everyone's taste of course. "May I suggest that sir might prefer the boef bourguignon?" We've enjoyed this series so much - James Martin's French Adventures - that I've just ordered the book from Amazon. He's cooked so many things that have had us positively drooling. I thought you said you didn't like medium rare? It's not just the colour, I like the middle pink, but dislike a steak on my plate in a pool of blood. I agree - but that steak in the picture isn't bleeding, it's too cooked for that. 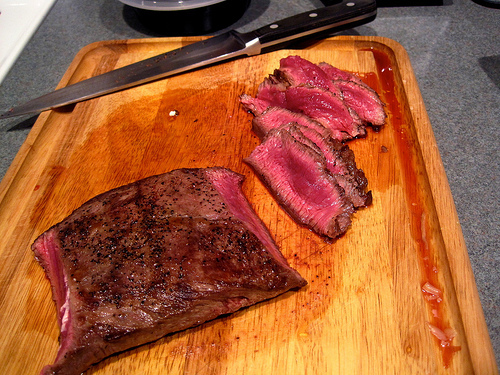 But I do like steak and find that most of the time we eat out and I have steak it is cooked far more then I would like. I think we have reached a consensus: the minor differences between us are covered by the natural variation among different chefs. But does anyone approve of the current fashion for undercooked fish (not from Aldi)? Depends how fresh it is. Never mind undercooked I don't like to eat fish in any way shape for form. Ahhhh proper fish...........now ya talkin........wi mushy peas and curry sauce bloomin awesome. Non of that slushy crap. Only ever fresh! The local chippy proprietor where I was brought up used to shut up shop at night then go out in his boat to catch the following day's cod. But for fish and chips these days, give me pollock any time. ... does anyone approve of the current fashion for undercooked fish? Only if it's sushi, but then it has to be GOOD sushi. Truly undercooked fish as you mean... no. Is it true that sushi was invented by two broke Japanese restaurateurs who couldn't afford a cooker? folks like us that's opening soon. Not a recipe, just a recommendation really. Grandessa marmalade - thick cut. It's an Aldi own brand and just about as good as you can get. If anyone's in to making fruit gins (it's forced rhubarb season and rhubarb gin is delicious) then Aldi's gin is very highly rated and cheap. Like under £10 for 70cL cheap (they do a 1L bottle as well). Oh, I see. Un toro loco is what it turns you into. Aldi marmalade is really good, There is a really excellent marmalade avaiable from one of the big fleecers though! Sainsbury do a delicious three fruits marmalade with lovely thick peel! For perfect marmalade, make your own! Haven't bought any for years.No shop-bought marmo comes close! We are probably just past the season for Seville oranges although there may be a few still kicking around. My ma-in-law and the Memsahib both used to make MaMade (in tins) but I haven't seen any of that for a while either. I thought it was a visit to a Spanish engine shed.